n a corner of a outbuilding at the farm that we call Grandpa’s Shed because it houses lots of my Grandpa Pete’s odds and ends, there is a 240 volt outlet and a few walls lined with metal where a welder was used by my great uncle years ago. My grandpa graciously let me reposition the shed’s contents to accommodate a couple electric kilns in the corner. 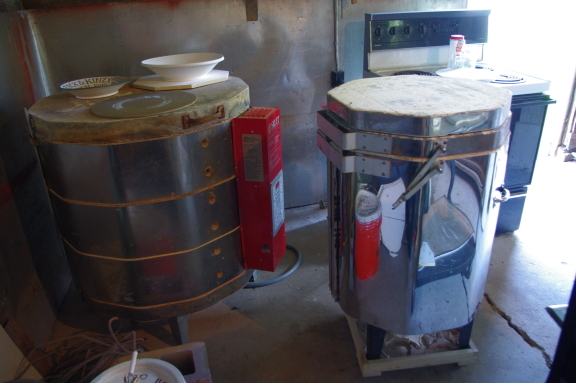 I haven’t gotten the larger kiln operational quite yet but I have been firing a few commissions in the smaller kiln. I feel lucky to fire my own work at the farm, and look forward to converting the quonset down the line into a kiln shed. For now this temporary solution is a good stepping stone until I can afford to re-do the electrical in the barn. 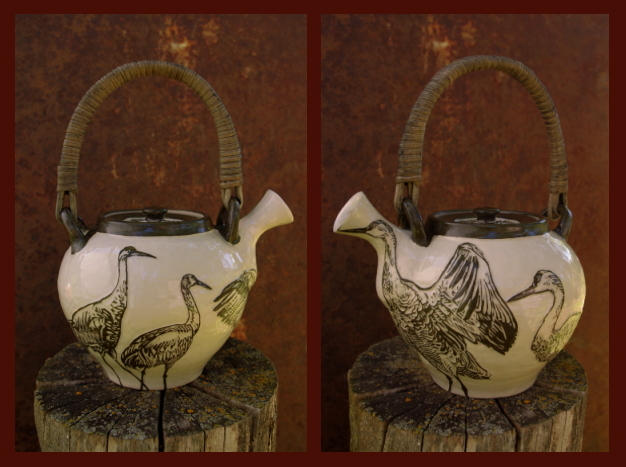 Here’s a teapot I made and fired in said shed a few weeks ago. It is a thank you gift for my former professor, Jenny Nellis of the University of MN Morris, for the kiln she gave me. The birds on it are sand-hill cranes. I love seeing them around the farm and hearing their rattling call.